The coupled power chokes product category from Würth Elektronik eiSos has a new member in the form of the WE-MTCI SMT multi-turn ratio double choke. Housed in the 5030 package, it is the company’s smallest double choke yet, and comes with different winding ratios from 1:1,5 to 1:3. 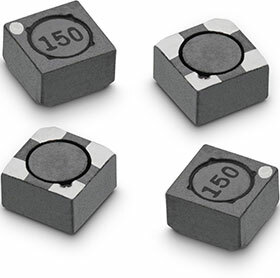 The magnetically shielded component with 0,8 kV isolation is specified for an operating temperature of -40°C to +125°C. The WE-MTCI is available in versions for rated currents from 0,45 to 0,95 A. The double choke is an ideal solution for buck/boost converters with regulated or unregulated output voltage. Isolated converter applications – such as flyback converters – with high packaging density are also areas of use, as well as step-up or step-down converters with auxiliary windings, as are auto-transformer applications.